Sabri, N., Yassa, N., Fazeli, M., Alavi, S., Fouladi, F., Salimi, L., Manayi, A., Tofighi, Z. (2009). Antibacterial Activity of Peucedanum ruthenicum, Johreniopsis seseloides and Cervaria cervariifolia Extracts. Iranian Journal of Pharmaceutical Sciences, 5(1), 37-42. Noor Sabri; Narguess Yassa; Mohammad Reza Fazeli; Seyed Hamid Reza Alavi; Fatemeh Fouladi; Ladan Salimi; Azadeh Manayi; Zahra Tofighi. "Antibacterial Activity of Peucedanum ruthenicum, Johreniopsis seseloides and Cervaria cervariifolia Extracts". 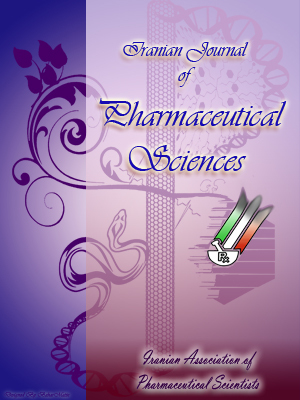 Iranian Journal of Pharmaceutical Sciences, 5, 1, 2009, 37-42. Sabri, N., Yassa, N., Fazeli, M., Alavi, S., Fouladi, F., Salimi, L., Manayi, A., Tofighi, Z. (2009). 'Antibacterial Activity of Peucedanum ruthenicum, Johreniopsis seseloides and Cervaria cervariifolia Extracts', Iranian Journal of Pharmaceutical Sciences, 5(1), pp. 37-42. Sabri, N., Yassa, N., Fazeli, M., Alavi, S., Fouladi, F., Salimi, L., Manayi, A., Tofighi, Z. Antibacterial Activity of Peucedanum ruthenicum, Johreniopsis seseloides and Cervaria cervariifolia Extracts. Iranian Journal of Pharmaceutical Sciences, 2009; 5(1): 37-42. Antimicrobial activity of the polar and nonpolar extracts of the roots and aerial parts of Peucedanum ruthenicum M. Bieb., Johreniopsis seseloides (C. A. Mey.) Pimenov and Cervaria cervariifolia (C. A. Mey.) Pimenov were examined against gram-positive and gram-negative bacteria. The polar extracts of the roots and aerial parts displayed no activity against bacteria, while the nonoplar extracts of the roots which contains coumarins, presented activity against Staphylococcus aureus, S. epidermidis, Pseudomonas aeruginosa and Escherichia coli. Plants play an important role for treatment of many infectious diseases. Peucedanum ruthenicum M. Bieb. Johreniopsis seseloides (C.A. Mey.) Pimenov and Cervaria cervariifolia (C.A. Mey.) Pimenov are placed in Apiaceae family . The genus Peucedanum comprises about 100-120 species, mainly distributed in Eruope and Asia. In Europe peucedanum comprises 29 species  while 4 species dedicated to Iran Include: P. glaucopruinosum, P. knappii, P. translucens and P. ruthenicum, which are distributed in the north and central provinces of Iran . Some species of this genus have been used traditionally in the treatment of cold, cough due to pathogenic wind-heat, accumulation of phlegm, heat in the lung, anti-tussive, anti-asthma and as a remedy for angina [4, 5, 6]. Therefore, the exracts of P. ruthenicum was subjected to investigation for antibacterial properties. Study on essential oil of P. ruthenicum fruits collected from Arak, was showed antibacterial activity against gram positive bacteria which may justify the use of this genus in traditional medicine and underline the importance of the bioactive ethnobotanical approach for discovery of the new antibacterial substances from plants . Previous phytochemical studies on some of the species of Peucedanum have shown the presence of furanocoumarin and their glycoside derivatives, linear-type furanocoumarin glycosides and simple coumarin glycoside in plant extracts [8-10]. Staphylococcus aureus, Bacillus subtilis, E.coli, Pseudomonas aeruginosa, Candida albicans, C. tropicalis and Streptococcus agalactia . P. ostruthin contained ostruthin (6-geranyl-7-hydroxy coumarin), imperatorin and umbelliferon, of which ostruthin showed strong activity against some species of mycobacteria (MICs 3.4 -107.4 μM) and umbeliferon displaied only weak activity (MIC= 0.79 mM) . Seed methanol extract of P. graveolens had moderate activity on Salmonella thyphi with zone inhibition diameter 5-9 mm . In addition some compounds such as: Coumarins, phenolic acids, terpenoids, flavoniods, fatty acids, normal alkans and one carbohydrate were found in methanol extract of P. ruthenicum [16, 17, 18]. Genus Johreniopsis and C. cervariifolia, belong to tribe of peucedanae, subfamily of Apioideae and family of Apiaceae. Johreniopsis genus has 4 species (J. oligactis. J. scopari, J. seseloides and J. sticticaulis) in Iran . From methanol extract of J. seseloides, some compounds such as: Flavoniods, mannitol, coumarins and a triterpen and have been detected. In methanol extract of C. cervariifolia, coumarins, terpenoid, flavoniods and a carbohydrate were identified . These two coumarin containing plants also were subjected to study of antibacterial activity. Aerial parts of P. ruthenium, J. seseloides and C. cervariifolia were collected from Arak (Markazi province), Haris (Kurdistan provice) and Golestan province in August 2004, respectively. The roots of the three plants were collected in October 2004. The plants were identified by Department of Biology, Faculty of Science, Tehran University, Tehran, Iran and were deposited with numbers (Hb.Akh.15487, Salimian 32 and Hb.Akh.16913) respectively in the herbarium of Dr. Akhani at above address. For the preparation of polar and nonpolar extracts from aerial parts and roots of P. ruthenium, J. seseloides and C. cervariifolia, they were shade dried at room tempreture and powdered by electric blender. Powdered materials (100 g) were perculated with 3×300 ml MeOH-H2O mixture (80-20 v/v) for 3×24 h separately. Extracts were concentrated under reduced pressure. The condensed products were re-extracted with 3×100 ml chloroform. Chloroform solvent was evaporated to prepare nonpolar extracts (3.96, 3.66, 1.02 % for aerial parts and 2.50, 2.77, 1.51 % for roots, respectively). The amounts of residue or polar extracts were 11.20, 11.60 and 4.26 % for aerial parts and 12.10, 11.36 and 5.60 % for roots, respectively. ATCC 29737, S. epidermidis ATCC 12229,Pseudomonas aeruginosa ATCC 9027, Escherichia coli ATCC 35218, which were obtained from Department of Drug and Food Control, Faculty of Pharmacy, Tehran University of Medical Sciences. Base plates were prepared by pouring 25 ml of melted Muller-Hinton-agar into sterile petridishes and allowed to set Muller-Hinton agar held of 48 °C, and was inoculated with a broth cultured 0.5 Mcfarland (1×108 cfu/ml) of the test organism and was poured over the base plates forming a homogenous top layer. Then some wells were prepared on the plates. DMSO (dimethyl sulfoxide) was used as a solvent to solve the extracts to obtain a 1% w/v concentration. This solution was loaded into the holes and incubated at 37 °C for 24 h. Antibacterial activity was expressed as the inhibition zone (mm) . The activity of Gentamycin was included in this equation to adjust for plate-to-plate variation in the sensitivity of a particular bacterial strain. Minimum inhibition of concentrations (MICs) of the extracts were determined against the tested microorganisms. The macrodilution technique in Muller-Hinton broth  was used against S. aureus, S. epidermidis, P. aeruginosa, E. coli, with dilutions of plant extracts from 0.0976 to 5 mg/ml of medium. MICs values were taken as the lowest concentration of the extracts which completely inhibited bacterial growth after 24 h of incubation at 37 °C. Gentamycin and DMSO with no extracts were used as the positive and negative controls, respectively. Minimum bactericidal concentration (MBC) was defined as the lowest concentration yielding negative subcultures or only one colony. Table1. Anitmicrobial activity of P. ruthenicm, J. Seseloides and C. cervariifolia extracts using cup plate method. The polar and nonpolar extracts of the roots and aerial parts of P. ruthenicum, J. seseloides and C. cervariifolia tested against 4 standard bacteria (gram positive and gram negative) strains. The zone inhibited diameters (ZIDs) of the extacts shown in Table 1 indicate that the polar and nonpolar phase of the aerial parts and the polar phase of the roots had no significant antibacterial activity against the tested bacteria. However the nonpolar phase of the roots showed inhibitory effect on tested bacteria. The MICs as well as minimum bactericidal concentrations (MBCs) of the extracts tested by the macrodilution techinique in Muller-Hinton broth are presented in Table 2. P. ruthenicum nonpolar root extract displied activity against S. aureus and E.coli with MICs 156.2 and 312.5 μg/ml, respectively while was inactive against S. epidermidis and aeruginosa with MICs of >1000 μg/ml. J. seseloides nonpolar root extract presented activity againt S. epidermidis and E. coli with MIC 312.5 μg/ml and S. aureus with MIC 625.0 μg/ml. J. seseloides extracts was inactive against P. aeruginosa with MICs of >1000 μg/ml. C. cervariifolia extract showed activity against all the tested bacteria with MIC 156.2 μg/ml for S. aureus and E. coli and 312.5 μg/ml for S. epidermidis and P. aeruginosa. Previos studies on the antibacterial activity of the genus Peucedanum has shown that 3 of the coumarins isolated from P. zenkeri (imperatorin, bergapten and isopimpinelline) had antimicrobial activities . P. ostruthin contained ostruthin (6-geranyl-7-hydroxy coumarin), imperatorin and umbelliferon, of those ostruthin had strong activity against some species of Mycobacterium (MICs range 3.4 to107.4 μM) and umbeliferon had only weak activity (MIC= 0.79 mM) . Methanol extract of P. graveolens seeds had moderate activity on Salmonella typhiwith zone inhibition diameter of 5-9 mm . In conclusion, this research displied that diverse antibacterial effects of different extracts e.g. crude extracts such as methanol, polar or nonpolar ones, depends on the type or also amounts of coumarins that present in the extracts will show positive or negative antibacterial properties. However the polar phase of the aerial and root parts and the nonpolar phase of the aerial parts did not show antibacterial activity but the nonpolar extracts of the plants roots contain coumarins showed activity against some bacteria. Table 2. The minimum inhibition of concentrations (MICs) and minimum bactericidal concentration (MBC) of the nonpolar extracts tested by Macro-dilution technique. aMean of MIC and MBC (n=3). This research was supported by Tehran University of Medical Sciences and Health Services grant. The authors are grateful of Mr. H. Jamalifar for his assistance in antibacterial examinations. Hedge C, Lamond JM, Rechinger KH. Umbelliferae. In: Rechinger KH, (editor). Flora Iranica. Graz: Akademische Druck-U. Verlagsanstalt, 1987; 162: pp. 442, 452, 455. Tutin TG, Heiwood VTT, Barges NA, Moore DM, Valentine DH, Walteres SM, Webb DA. Flora Europae. Cambridge: The University Press, 1968; 2: 360-361. Pimenov MG, Peucedanum L. In: Rechinger KH, (editor). Flora Iranica. Graz: Akademische Druck-U. Verlagsanstalt, 1987; 162: pp. 442, 444, 454, 455. Gan WS. Manual of medicinal plants in Taiwan. Taiwan: National Research Institute of Chinese Medicine, 1965; 3: 675. Kong LY, Li Y, Min ZD, Li X, Zhu TR. Qianhu Coumarin I from Peucedanum praeruptorum. Phytochem 1996; 42: 1689-91. Tang W, Einsehbrand C. New York: Chinese drugs of plant Origin. Springer, 1992; pp. 753-7. Alavi SHR, Yassa N, Fazeli MR. Chemical constituents and antibacterial activity of essential oil of Peucedanum ruthenicum M. Bieb. fruits. IJPS 2005; 1: 213-8. Alavi SHR, Yasa N, Fuladi F, Shafiee A. Chemical composition of the essential oils of Peucedanum ruthenicum M. Bieb. leaves, flowers and fruits. IJPR 2006; 2: 143-7. Kuzmanov B, Andreev N, Kosovka V. Chemotaxonomic study on Bulgarian species of Peucedanum L. Anales Jardin Botanico de Madrid 1981; 37: 779-88. Lu M, Nicoletti M, Battinelli L, Mazzanti G. Isolation of praeruption A and B from Peucedanum praeruptorum general pharmacolog-ical evaluation in comparison with extracts of the drug. IL Farmaco 2001; 56: 417- 20. Soine TO, Zheleva A, Mahandru MM, Erhardt P, Bubeva-Ivanova L, Natural coumarins VII:Isolation and structure of a new coumarin, peuruthenicin, from Peucedanum ruthenicum M. Bieb. J Pharm Sci 1973; 62: 1879-80. Ngunde Ngwendson J, Bedir E, Efange SMN, Okunji CO, Iwu MM, Schuster BG, Khan IA. Constituents of P. zenkeri seeds and their antimicrobial effects. Pharmazi 2003; 58: 587-9. Schillacri D, Venturella F, Venuti F, Plescia F. Antimicrobial and antiproliferative activity of P. nebrodense (Guss.)Strohl. J Ethnopharmacol 2003; 87: 99-101. Schinkovitz A, Gibbons S, Stavri M, Michael J, Edge C, Bucar F. An antimycobacterial coumarin from the roots of Peucedanum ostruthium. Planta Med 2003; 69: 369-71. Phulan R, Neeraj KH. Antimicrobial evaluation of some medicinal plants for the anti-enteric potential against multi-drug resistant Salmonella typhi. Phytother Res 2004; 18: 670-3. Alavi SHR. Thaxonomic revision of Peucedanum Complex in Iran. Thesis for PhD degree. Isolation and structure of a new coumarin, peuruthenicin, from Peucedanum ruthenicum M. Bieb. J Pharm Sci 1973; 62: 1879-80. Alavi SHR, Yassa N, Shafiee A, Fuladi F. A new furanocoumarin from Peucedanum ruthenicum. Pharm Biol 2008; 46; 377-9. Alavi SHR, Yassa N, Hajiaghaee, Matin Yekta M, Rezaei Ashtiani N, Ajani Y, Ahdjiakhoondi A. Phenolic compounds from Peucedanum ruthenicum M. Bieb. IJPR (in press). Viletinck AJ, VanHoof L, Totte J, Lasure A, Vanden Berghe D, Rwangabo PC and Mrukiyumwam J. Screening of a hundred Rwandese medicinal plants for anti-micribioal and antiviral properties. J Ethnopharmacol 1995; 46: 31-47. Pessini GL, Dias Filho BP, Nakamura CV, Garcia Cortez DA. Antibacterial activity of extracts and neolignans from Piper regnellii (Miq.)C.DC. var. pallescens (C.DC.)Yunk. Mem Inst Oswaldo Cruz, Rio de Janeiro. 2003; 98: 1115-20.